Our new 3-hour chocolate-making class in Umbria is available at a 25% savings – enjoy a discount, lots of fun and plenty of chocolate – what could be better? Our chocolate making class will take place near Perugia, Umbria, right next door to the Perugina chocolate factory, creators of the Bacio, the Italian chocolate kiss. The new school is designed so that each student has their own well-equipped workspace for this hands-on lesson, and plenty of chocolate to play with. Our chocolate making lesson in Italy will be dedicated to making cioccolatini, little gift chocolates that make friends faster than Facebook. As you learn the tricks of handling chocolate like a professional, you will be encouraged to personalize your chocolates with your own creative flair. Anita (that’s me) will be with the class to translate the Italian chocolate master’s instructions, as well as get hands-on messy. Since I love dark chocolate -milk chocolate is simply not chocolate to me – my focus will be on making the darkest cioccolatini. I promise to share. 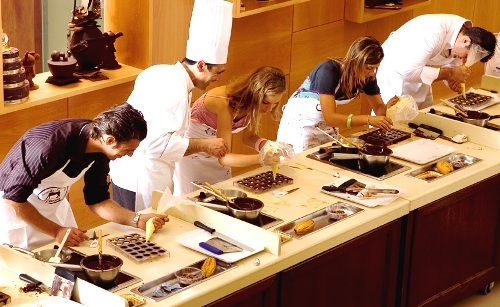 This chocolate making class is complimentary for our Umbria Walking & Cooking Tour participants. Non-tour participants can join this 1-day chocolate making lesson at the cost of $100 per person (75 euro) -that’s a savings of 25% over our introductory price. 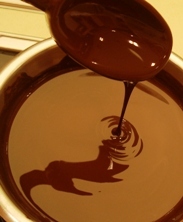 Includes a 3-hour lesson under the tutelage of an Italian chocolate master, translation services, plenty of chocolate for your creations, apron (with your chocolate fingerprints) and anything leftover that you don’t manage to eat.